Beyond Sightseeing: You'll Love The Sound Of America's Best Parks The National Park Service is racing to record soundscapes of each park that capture nature for the ear. "If we start to lose sounds of wilderness, we start to lose a piece of us," one scientist says. 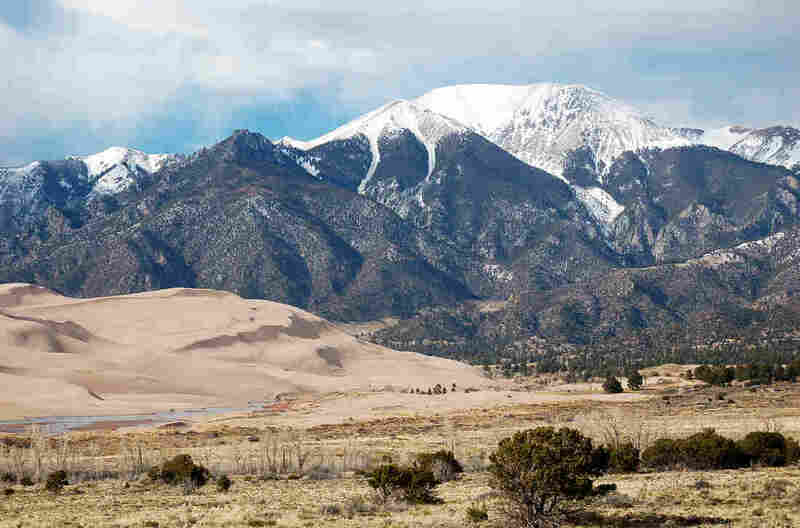 Great Sand Dunes National Park sits at the base of the Colorado Rockies. The dunes soak up sound like a sponge, but human noise can still be heard. We started at Colorado's Great Sand Dunes National Park and Preserve. The dunes loom into view like a 30-square-mile patch of the Sahara desert that somehow ended up at the foot of snow-capped mountains. A hailstorm was pounding down, so we ducked into the park's visitor center to talk to biologist Kurt Fristrup, mastermind of the park service's soundscape project. "The weather here can change very quickly," he said, with bits of hail still stuck in his hair. The National Park Service has long been concerned about human noise in national parks, Fristrup explained, and he's collected a staggering amount of sound. Helicopters, off-road vehicles, nearby road traffic, airplanes — the sound of "us," basically. Park authorities wanted to know if human-made sound was diminishing the "park experience" for people. "We're interested in you being able to hear the sound of a squirrel scurrying through the leaflets 100 feet away, and other things like that," Fristrup said. "These are the small moments that can really connect you with the park." He first became entranced by natural sound as a young camper and hiker, he said. For Fristrup, these wild sounds — even silence — are an integral part of the outdoor experience. So he started putting microphones in the parks, to detect human-made sound leaking in. It wasn't possible, of course, to eliminate all "unnatural" sound, since the Park Service's mission is to bring people and nature together. "The signature challenge for the Park Service," he says, "is to bring people to these places without destroying the essential qualities that made [a] park worth founding in the first place." To find out how Fristrup's team captures soundscapes, one of us — Bill — hiked up into the high country of Rocky Mountain National Park with Jacob Job, an acoustic biologist at Colorado State University who also works with Fristrup in the Park Service's Natural Sounds and Night Skies division. Job carried a portable digital recorder, microphones and batteries — 30 pounds of audio equipment in his backpack — as he looked for just the right place. Many people talk about "taking in the sights" when they visit a new place, but Job is different. "I feel like I hear the place first," he said, setting up his recorder on a tripod in an area called Moraine Park. It's a grassy valley with sharp peaks all around. "I had just seen these small trees sitting out here," he explained, "and I figured it might attract some birds." Sure enough — there's a wetland nearby, which attracts lots of birds. The wind here has its own sound, as it blows through pine needles on the evergreens here. Soon, there's chorusing from ravens and blackbirds, and a group of wild turkeys walks right by, gobbling. A soundscape is the sum of natural sound in a place, Job explained — not just "in your face" sounds like coyotes or thunder, but the background hum of water, wind and rustling leaves. Normally, Job collects several days of sound, and computers help sort through it all. It's a lot of work, but for Job, a work of love. Certain wild sounds are getting harder and harder to find, he said, and that loss is huge. "If we start to lose sounds of wilderness, we start to lose a piece of us," he said. "And that really hits at a place that we don't fully understand, but which is important." Less than an hour into the recording day, the sound of a machine broke the spell. Job looked up. "This is a prop plane," he said. "We deal with this on a constant basis. You get shook back into reality." A model was developed to understand relationships between measured sound levels and variables such as climate, topography, human activity, time of day and day of year. In general, the brighter the spot, the greater the sound intensity. The team's recording all across the country has revealed that human-made sound is everywhere in parks. On any given day, Fristrup said, 25 percent of the time you'll hear some form of sound that can be traced to people. Even in Great Sand Dunes National Park, a place known for its silence, we had a heck of a time escaping human-made sound — backhoes on the road as we hiked in, highway traffic and, of course, tourists, even on a cold, blustery day. So we decided to climb up into the dunes. To do that, we had to cross a fast-moving, shallow stream and walk through a 40 mph wind. It's the wind that created the dunes, carrying the sand eroded from nearby mountains and piling it up at the foot of the Sangre de Cristo range. The stream sweeps some of that sand down off the dunes; as the water dries, the sand gets blown back up in a never-ending cycle. Once we reach the huge piles of sand, we climb. The dunes rise up to more than 700 feet — the highest in North America. When we duck behind a dune, the howl of the wind dies to a whisper — the sand absorbs the sound like a sponge. On a calm day, Fristrup says, it's the kind of quiet that animals experience when we're not around. And that's something that Fristrup has been thinking about. Animals evolved for millions of years in natural soundscapes. How does our sound affect them? (Left) Kurt Fristrup and Bill McQuay record the sounds of the Great Sand Dunes. (Right) Fristrup says wild sounds trigger "the small moments that can really connect you with the park." To figure that out, Fristrup and other scientists have conducted experiments. They found that if you add just a few decibels of "unnatural" sound, like a distant highway, it throws animals off-kilter. "In 30 to 40 percent of natural areas," he explained, "sound levels are three decibels higher than normal." Animals that have — and depend on — acute hearing notice a sound that's even that soft. "Imagine you're an owl looking for your dinner," Fristrup said. "A three decibel increase in sound level cuts in half the area in which you could hear those sounds, he said. "So you are half as efficient in finding food, with a relatively subtle increase in background sound level." Prey animals, like small birds, have a harder time hearing predators as the background decibels climb, and all animals need to hear to communicate. Fristrup is optimistic, though, that park managers can do something about all this noise. "Natural soundscapes can be fully restored as soon as we are smarter about noise sources," he said. Electric vehicles are quieter. Planes can be routed away from parks. Off-road vehicles already are limited in some parks. And soundscapes of nature are starting to win some respect. 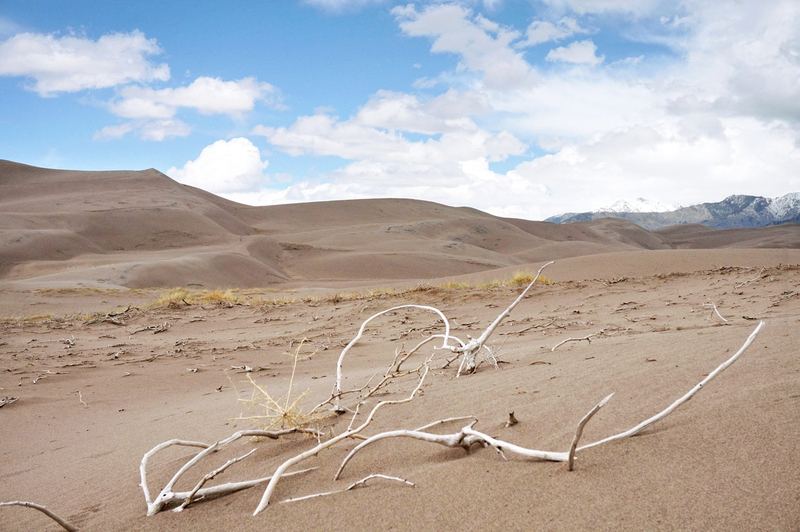 A few years ago, an oil and gas operation wanted to drill near Great Sand Dunes. An environmental group argued that the dunes' silence was unique and sued to stop the project. A judge agreed. "It's not a common story out here in the West," Fristrup said, "but this was a case where noise played a role in a land-use decision." Fristrup is optimistic about protecting soundscapes. 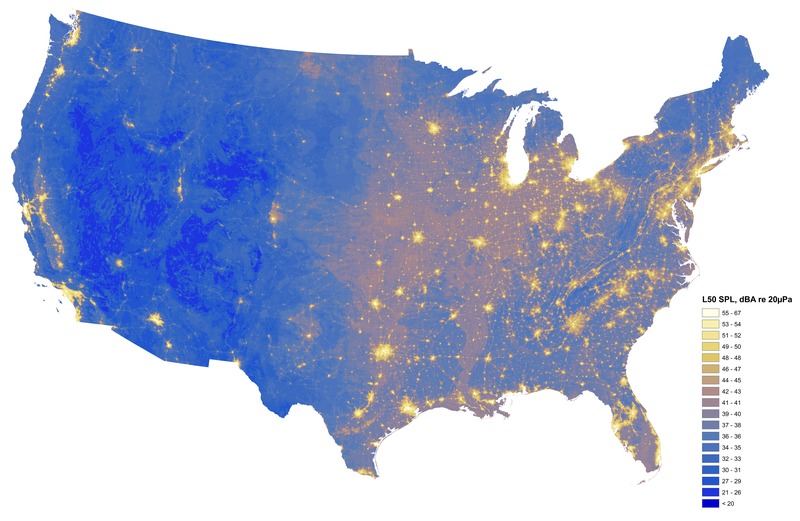 "The good news is that there are a lot of places where those noise events are infrequent enough," he says, "(that) you get many, many minutes — sometimes a few hours — of noise-free time." And the Park Service has a soundscape archive that will help you find out where those places are. Bill McQuay is an audio producer with the Cornell Lab of Ornithology.